Oh, For a Teutonic Crew! In a nutshell, Germans, British, and Scandinavians are Teutonic people. The peoples of southern Europe, including Italians and Greeks, are non-Teutonic. A review of the behavior of Teutonic and non-Teutonic Captains and Crew seems to indicate that Teutonic seafarers are more willing to follow set procedures, are more duty bound and diligent, and perhaps even more courageous than their southern European counterparts. April 15th, 1912. The British registered HMS Titanic sinks on a cold, calm night on the north Atlantic. Captain Edward J. Smith (Teutonic) went down with the ship along with all of his crew not needed to man lifeboats. 2,223 people were on board the Titanic and only 571 were saved; mostly female passengers and children. Throughout that horrific night the crew, mostly British, maintained orderly control of the evacuation procedure, doing their best before finally settling into watery graves. July 25, 1956. The MS Stockholm, under Swedish registry and with a Swedish (Teutonic) Captain and Crew, rammed the Italian Liner, the SS Andrea Doria, (Captained by Italian Piero Calamai), in a dense fog near Nantucket. The front of the Stockholm was smashed, but she remained seaworthy. 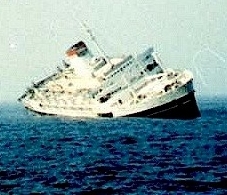 The beautiful Italian liner listed to the side, but it took 11 hours before she finally plunged to the bottom. 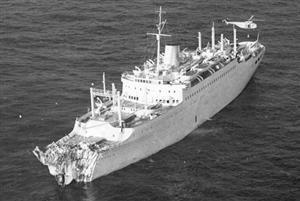 Fortunately, out of 1134 passengers and 572 crew members aboard the Andrea Doria, only 46 souls were lost. Five passengers died on the Stockholm. Once it was determined that the Stockholm was sea worthy, the crew from the Stockholm started receiving passengers from the Andrea Doria’s lifeboats. However, the first lifeboats contained mostly Andrea Doria crew (waiters and stewards) rather than passengers. So dismayed were the Swedes at this maritime cowardice that fights broke out between the Swedish (Teutonic) crew and Italian (non-Teutonic) crew members. Later in the night, when passengers from and Italian liner finally boarded the Stockholm, Andrea Doria crew members were already grazing at the buffet line. While his non-Teutonic crew acted disgracefully, Captain Piero Calamai, an Italian, acted as courageously as any seaman possibly could after the collision had taken place. After all passengers and crew had evacuated the beautiful Andrea Doria, Calamai told his crew he wished to die at the helm as atonement for the loss of his vessel. At the insistence of his officers, Calamai was the last man to step off the Andrea Doria. He never again commanded another vessel and died a broken man in 1972. The Oceanos was captained and crewed by non-Teutons exclusively, except for the entertainment staff and British Cruise Director Lorraine Betts. Hours after the Captain had abandoned ship and had been rescued, Betts and her entertainment staff assisted the last of the Oceanos’ 571 passengers to safety. Betts wasn’t the captain, but she had a Captain’s courage, being the last to leave the foundering vessel. January 13, 2012: The Costa Concordia an Italian registered cruise ship ran aground and capsized in the Tyrrhenian Sea just off the shore of Isola del Giglio on the western coast of Italy. 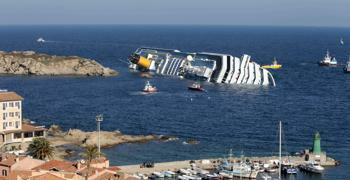 The Captain, Italian Francesco Schettino, left the ship with hundreds of passengers aboard and has become the front line story of the disaster. In one communication with the Italian coast guard, Schettino is told to get back on the ship and handle the evacuation; he refuses, being the latest non-Teutonic coward to Captain a large vessel. It is too bad that Andrea Doria Captain Calamai isn’t around to remind Schettino how all ship captains, Teutonic or otherwise, should behave. 4 Responses to Oh, For a Teutonic Crew!